Ocean, ocean, ocean is all around you in this fun, contemporary house filled with windows. All four bedrooms utilize large, sliding glass doors that allow you to never miss an ocean view. Even the bathrooms and gym offer great views as well. 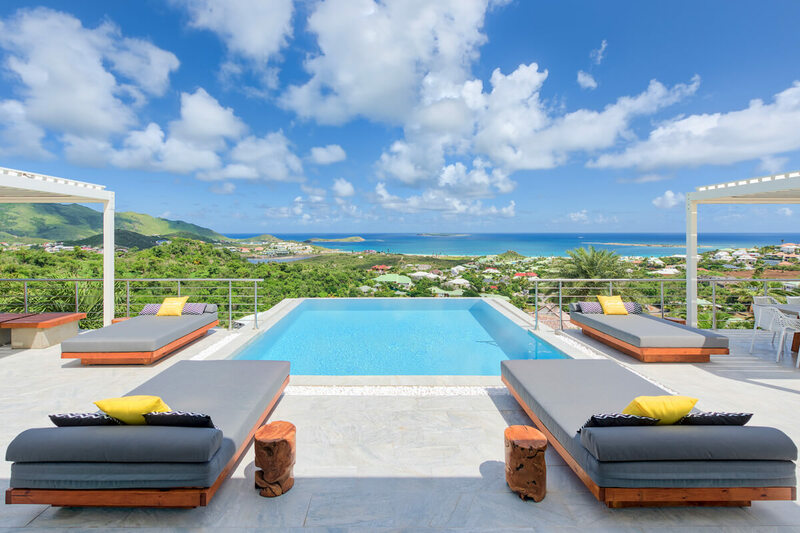 The plunge pool makes you feel like you could jump from its turquoise waters right into those of Orient Bay below. No matter where you are in the house, the unique layout always allows you to enjoy the lush tropical landscape and gorgeous turquoise waters of the ocean. Turquoze Villa is a modern, hillside villa above Orient Bay. Its simple, modern spaces are maintained by daily housekeeping, a poolman, and a gardener. The teak wood deck is filled with chaise lounges and surrounds the plunge pool. Al fresco dining sits opposite the lounging area, shaded by trees overhead. The entire deck enjoys a stunning view over the Orient Bay area, and the hillside glitters with light at night. The air-conditioned gym on the lower level also faces the sea, and is equipped with two exercise bikes, resistance equipment, and free weights. Turquoze’s interiors are fully air-conditioned and chicly decorated in all-white. Sliding glass doors lead from the terrace into the large living area, where guests can watch movies on the satellite TV and DVD player. A pass-through bar connects the living room with the kitchen, which features modern appliances, an espresso machine, and luxurious finishes. All four king suites have ensuite bathrooms, exterior and interior access, and ocean views. Two are located on either side of the living room, the third is upstairs, and the fourth is downstairs. Orient Bay Beach lies at the bottom of the hill, only a short drive from Turquoze. This property is bordered by an electric gate and has personal WiFi.